CHICAGO (May 2, 2013) - South Atlantic League All-Star infielder Rangel Ravelo has earned a promotion. The Kannapolis Intimidators and Chicago White Sox announced today that the first baseman will move up to the Winston-Salem Dash, the Sox Class A-Advanced affiliate. In corresponding moves, the Intimidators received infielder Brett Tanner from Winston-Salem, and catcher Michael Marjama was placed on the Disabled List, effective April 29. 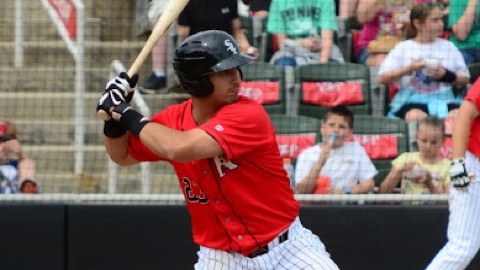 Ravelo, who earned SAL Midseason All-Star honors as a third baseman in 2012, has appeared in 17 games for the Intimidators this season, all at first base. The 21 year old is batting .226 (12-53) with nine RBI and four doubles this season. Last year, he paced the club at the plate through the first half of the season, batting .290 heading into the All-Star Break. The White Sox selected Ravelo in the sixth round of the June 2010 draft out of Hialeah (Fla.) High School. Tanner, 25, is off to a hot start in eight games played at Winston-Salem, batting .417 (10-24) with five doubles and three RBI. He has an OPS of 1.158 with the Dash. The Sox selected him in the 32nd round of the June 2011 draft. Last season with Advanced Rookie Great Falls, Tanner enjoyed a strong season at the plate, batting .280 (ninth in the organization) and led his team in extra-base hits (25) and tied for the team lead with four home runs. The Intimidators are in Savannah, Ga., tonight to play the second game of a 3-game set against the Sand Gnats at Grayson Stadium. First pitch is at 7:05 p.m. The team returns to Kannapolis on Saturday to open a 4-game series against the Greensboro Grasshoppers. Saturday's game will feature post-game fireworks presented by Freightliner Rec Club. The Kannapolis Intimidators are in their 19th season of professional baseball in the community and 13th as the Class A Affiliate of the Chicago White Sox. The team plays home games at CMC-NorthEast Stadium, located at I-85, Exit 63. For ticket information, please call the F&M Bank Box Office at (704) 932-3267 or visit IntimidatorsBaseball.com.